We've been overdue for a "Dishes with Fishes" post for a while now, so here is a look at some of the fish and seafood we've been eating. Previous posts can be found here, here and here. 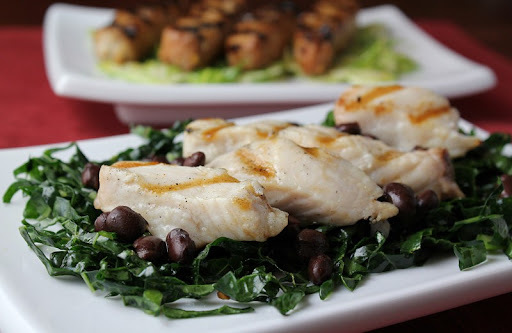 One day, with a bounty of Mako Shark from Catalina Offshore, we did it up two ways. This first one was grilled very simply. 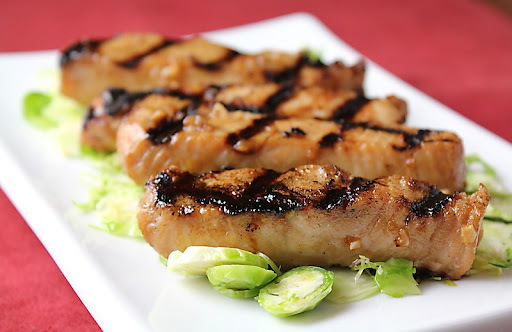 For the second dish, we used a teriyaki-style marinade, and served it with shaved brussels sprouts from our garden. "Pil-Pil" potatoes have become a favorite of ours. We call them that because we first made them after we saw them as a side in a video about making salt cod in the Portuguese "Pil-Pil" style. They went very nicely with this Cabrilla Grouper. 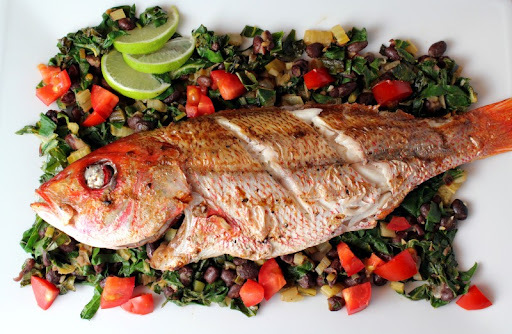 We have been really happy with the whole Cardinal Snappers we've been getting from Catalina Offshore and have been experimenting with different ways to cook and serve them. This version was super moist and flavorful, and the beautiful color of the skin still really came through after cooking. 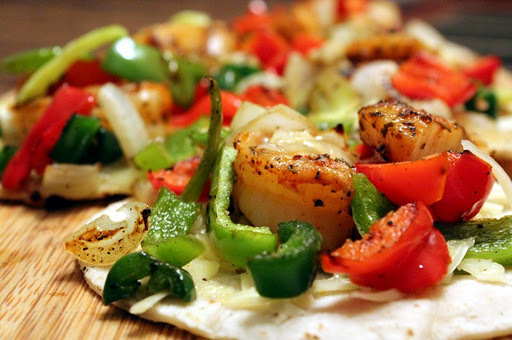 Tacos Gobernadores, which I think of as shrimp tacos with peppers, onions and cheese, are a staple at local mariscos trucks. This was our take - with some sea scallop thrown in for good measure. Smoked bay scallops are an awesome treat that we first started making this year. They definitely have an "I'll just eat one more" quality to them. Good stuff. This time we also smoked an assortment of fish - we often have pieces left over, and smoking is a great way to use them up. These all look great! 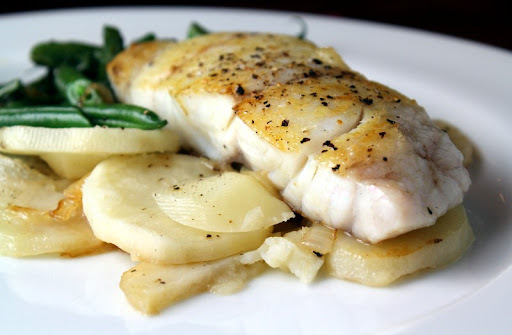 I tried Mako Shark for the first time last year and couldn't believe how juicy it was. Thanks, Alyssa. This shark was definitely juicy and flavorful, I've definitely had shark in the past that has tended to go dry. Not sure if the difference is the type of shark, or just better quality fish from Catalina Offshore. 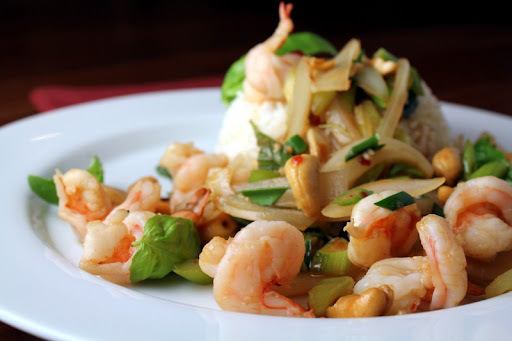 As always, you two make the best looking fish dishes on the Net! It's been over a month since we've been to Catalina Offshore. I think a quick visit is due. 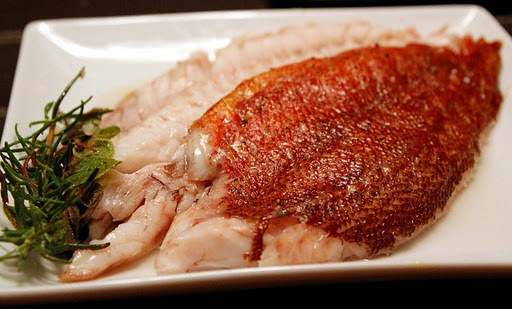 I love the whole snapper dishes. I saw some whole fishes last time I was there and was wondering about them. Hi CAB - we're so lucky to have a resource like Catalina Offshore. We get fish from them almost every week. Love the smoked scallop photo. May I ask what temp, type of wood, and length of time? I once enjoyed barely warmed but nicely smoked scallops at a sushi place and they were absolutely memorable. 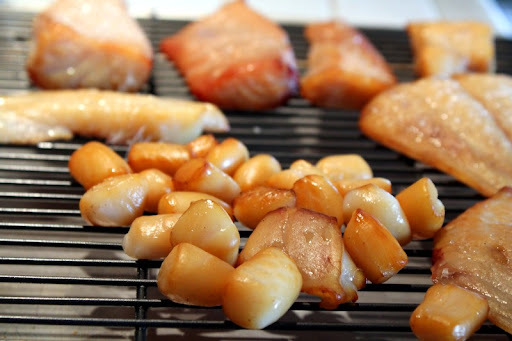 We smoke the scallops like we smoke fish - see our post on smoked trout for the details. For wood, though, we've since switched to a mix of pecan and alder instead of oak and apple.